BaddersWeb is a website template software solution for badminton leagues and associations featuring an easy to use content management system back-end for update by specified association members. 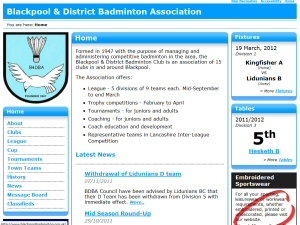 It was developed by EasierThan Website Design in conjunction with Blackpool & District Badminton Association (the first of many Customers...) and as such is built with badminton players in mind. The software has been designed to be a flexible re-usable template solution that can quickly be deployed for another association or league, but also with the necessary flexibility to add more features as required. Comprehensive badminton league website software with an easy to use back-end. Both the public facing front-end and admin back-end of BaddersWeb are rich in Features to handle club, league, cup, tournament, inter-league (town teams), news, association history, downloads, officers, committee information and more. If you represent a badminton league or association and are looking for an affordable well featured website solution that allows you to easily control your own content, then BaddersWeb is for you. We realise that most badminton associations and leagues do not have bottomless coffers and have priced BaddersWeb accordingly. Please take a look at our Pricing page for details. We're sure you have lots of questions so please take a look round the site (including our FAQs page) and at our Customers' websites.